The Cali-Baja region is home to a large, educated, and highly skilled workforce that benefits businesses on both sides of the border. For businesses looking to tap into this talent, or those that want to leverage the talent of their employees, it’s important to know what’s involved in making the most of this diverse and talented human capital. 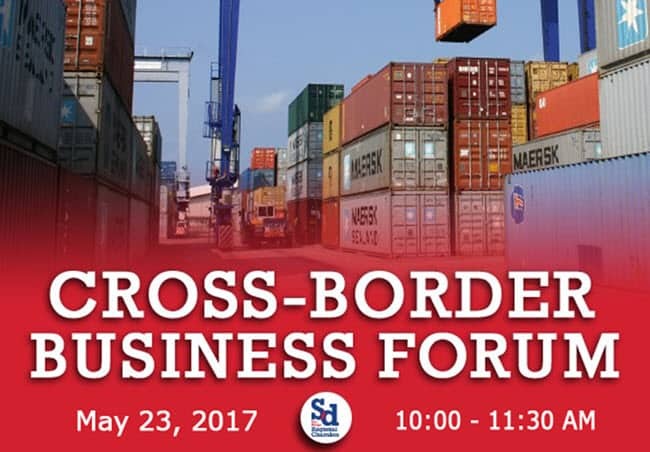 Join us for our upcoming Cross-Border Business Forum on May 23rd at the Club de Empresarios in Tijuana from 10:00 – 11:30. What programs are in place to develop our binational workforce? What issues we are facing when it comes to cross-border workforce development? What are the regional workforce needs and opportunities for business expansion through a binational workforce? This is a great opportunity for Mexico and US academia and companies that offer research and development, manufacturing and trade services or anyone interested in the potential and current impacts of immigration regulations on the human capital exchange and growth of business in our region. We invite you to bring your ideas and questions and join the discussion! Space is limited, RSVP as soon as possible in order to secure your spot. Participation in the Cross-Border Business Forums is open to bronze and above members of the Chamber or those considering membership. If you are not yet a Chamber member, please contact me at cgant@sdchamber.org or (619) 544-1392, to discuss membership opportunities or to register for the forum as a guest.